Map showing the number of visitors at each reserve. Map showing the number of days visitors used each reserve. 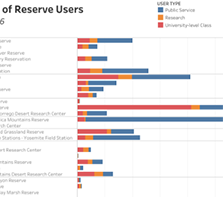 Number of researchers, university class students, and members of the public (including K-12 schoolchildren) using each reserve. 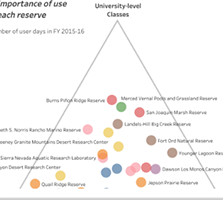 How each reserve supports university-level teaching, research, and public service. 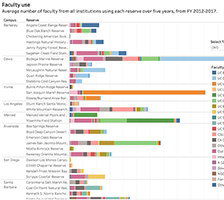 Number of faculty from UC, other colleges and universities, governmental organizations, and other institutions who used reserves. Map showing the reserves visited by faculty from each UC campus. 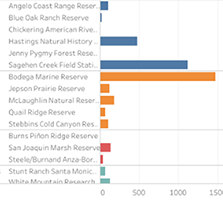 Number of publications recorded for each reserve in the NRS bibliography.